Insulated flexible cables and multi wire cables from 5 mm. up to 35 mm. Insulated flexible cables and multi wire cables having a cross section from 4 mm up to 150mm2 . Flat cables from 5.0mmx2,5mm up to 35mmx6.5mm with a cross section up to 150mm2. Pintles :Two pintles are closed hydraulically whereas the other pintles are all motorized ones. Reel Loading /Unloading System:Being the pintles at a fixed height, the loading /unloading of the spool, takes place by means of a steel plate (motorised platform), driven by a screw nut connected with an A.C. Motor and with an inverter. 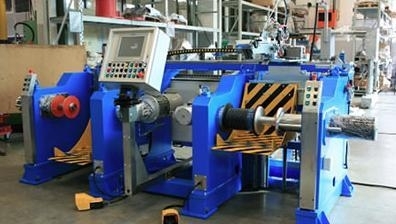 Wire Guide :A single automatic wire-guide is placed in the upper part of this unit. It is driven by a Brushless Motor in Digital electrical axis with the Take - up motor. Thanks to this system, the quality of the cable layer upon layer is excellent. Hydraulic Cutter and Caterpillar :Both these units are placed on an holder wire-cable plate. 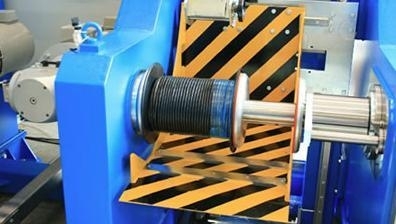 As the pre-set length has been reached, the cable gets automatically cut and carried on, up to the wire-guide rolls. By doing so, the Operator finds the cable ready for being hooked to a new spool. PLC S7 controls PS motorised take up, as all PS machines, is a reliable and sturdy one.